This is the time of year for people to make resolutions – eat right, exercise more, read a certain number of books, make better grades, get more sleep, and while these are great resolutions, I would like to propose a resolution that will not only make a difference in your student’s life but in your family. The resolution – have dinner together as a family. I am surprised at how few families have dinner together anymore. I often say at school that I’m going home to cook and have numerous kids respond with “I wish my dad or mom would cook.” The norm seems to be fast food in the back of a car while parents are rushing kids from one activity to another. Students have told me that when they do eat at home, it’s in front of the television or everyone is buried in their electronics. Make this the year to use the dinner hour intentionally and wisely. Our family dinner table is a television and electronics free zone. A place where we talk about our day – the good and the bad. We talk about what’s coming up tomorrow. We talk about our disappointments and our accomplishments. What we talk about isn’t as important as the fact that we are just talking. We often play the “high-low” game. What was the best part of your day? Why? What was the low part of your day? Why? At the new year, we have taken Christmas cards and pull one each night and talk about memories we have of that family and pray for them. We read a section of a book together sometimes and discuss that. I loved what the Six Sisters did with their 4×4 Dinner Challenge last year; take the lead and organize this for a group of your friends. (http://www.tofw.com/Six-Sisters-4×4-Challenge-Camille-Six-Sisters-Stuff/s/798) The options are limitless! When our children were younger with crazier schedules, we set a goal that X many nights a week we would have family meals together, and we did our best to stick to this. Sometimes when Scott had a particularly busy schedule, we would have our family meal at breakfast. This would mean we would get up earlier than normal, but the pay off of staying in touch with each other was worth it. And as an educator, the students who typically succeed in the classroom and not the busiest but the ones who are most grounded in good families. And on a side note, I have seen students who have less than ideal home lives be “adopted” into families and share meals and live with them on a regular basis and turn their world around. Intentionally spending time with our children makes a difference not only at home but in the classroom! I am sadden to think that so many well intended parents think they are doing their kids a favor by having them involved in multiple activities after school everyday in order to get them “ahead” in life. In an effort to do something good for our children, we are actually harming them by cheating them out of family time. The best thing a parent can do to get a child ahead is to give them a safe and stable family environment with time to speak and be heard. All families will benefit from this; whether it is a large family with lots of young kids, a single parent family, or an older family like mine with only one teenager at home. I use to hear my friends discuss how their child was in this league in sports or at this level of dance and the sacrifices made to get them there, and I would often feel like my kids were behind. It’s not as exciting to say, “we had family dinner 5 times last week followed by cards and games.” This is not a glamorous life but one in the end that is richly rewarding. So for 2014, give yourself permission to be a “boring” family. The family who eats together most nights of the week and in turn really knows each other. Oh how I SO agree. 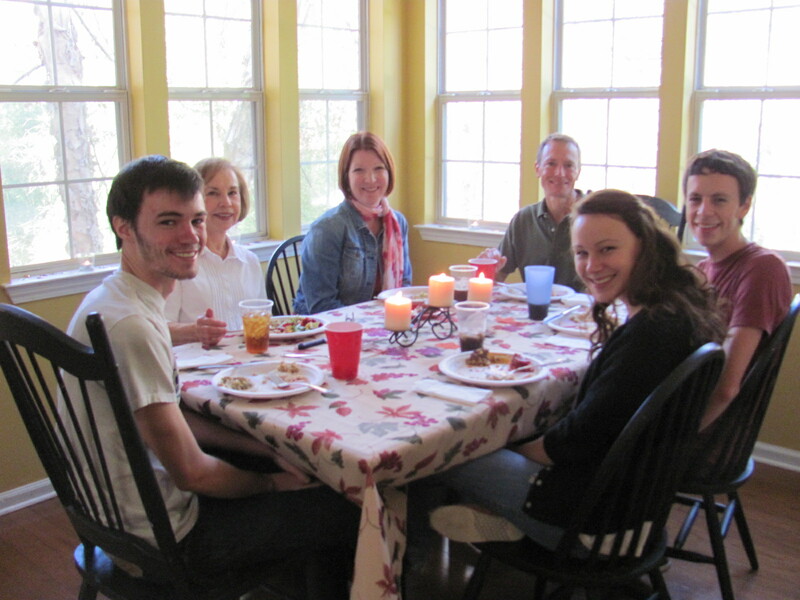 We love our family meals and will change dinner times just to eat altogether. Having spent a lot of time apart due to military experiences we really value our time together. I truly agree that it makes a huge difference. Great article! Thanks, Pam! I’m quite sure dinner at your house is not boring! !